Learn the Ultimate Equine Massage Protocol from an Expert. Come and learn the technique of a recognized expert in the field. His expertise will help you fine tune your massage skills so you can bring the well-known benefits of non-invasive gentle massage techniques to your horse(s). This course is based on the book "Top Massage for Top Balance". 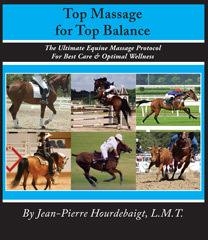 With over 155 illustrations and photos, this book teaches you how to use proven massage routines and stretching exercises in a specific sequence to most benefit your horse wellness and fitness level at its best. This "Top Massage for Top Balance" manual is the most complete book on the subject and contains information you cannot find anywhere else! The basics of the equine massage for you and for your horse. Detailed information on each individual muscles targeted in the Top Massage Protocol. The Myofascial “Tune-up” massage routine. The “Origin-Insertion” sport massage technique on all major muscle groups of your horse. The basics of equine stretching. This course will develop your skills and confidence in providing the best massage to your horse for best balance. The knowledge gained from this program will contribute to your overall horsemanship and professional expertise. Regular application of the Top Massage technique on your horse helps you get the most of your animal’s well being and is your best prevention. When dealing with injury, it will assist the horse’s natural healing process, saving on recovery time, while providing most gentle care. You will enjoy the lasting benefits that this unique approach delivers.